OK, so Yahtzee was talking about Castlevania: Symphony of the Night recently. And that led to some discussion with fellow gamers, which led to me purchasing a used copy on eBay 1I’m playing the original Playstation version, which I’m playing on my PS2, which is still the most recent console I own. And anyway, it seems like a good synthesis of the last two games I blogged about, Aquaria, a “metroidvania”-style 2D game with an emphasis on exploration, and Amnesia, a horror game set in a spooky castle. The fact that they all end in “-ia” seems to be coincidental, but maybe I should scour the Stack for other such games to see if there’s a pattern. Not that Casltevania is a horror game exactly — it’s got a vampire antagonist and an over-the-top gothic style, but it’s more fantasy than anything else. In fact, this particular entry in the series has strong FRPG elements, which came as a surprise to me. My prior experience with the Castlevania series is slight, owing to growing up primarily a PC gamer. I recall watching a friend play one of the prior episodes when we were both in college, probably on the SNES, and I’ve played on an NES emulator the first few sections of the original — just enough for the first few segments of Symphony of the Night to be very familiar. Those experiences left me confused about the term “metroidvania”, which didn’t seem to describe the Castlevania I had seen at all. The reason, I now know, is that those weren’t the games that inspired the term. Symphony of the Night was, and that is the main reason I decided to play it. So, to begin. This is a game where your ability to fight and survive is highly dependent on your equipment, and to emphasize this, it does something I’ve seen a few other games do: it starts you off in an extremely buff state, lets you play through an intro like that, and then takes it all away from you. In fact, it does this twice. The very opening of the game, before it plays the credits, is apparently the ending of the previous game, comprising a few stretches of corridor, a secret passage, and a boss fight against Dracula himself, in which he utters one of the most famous lines of awkward videogame dialogue to ever be loosely adapted from Japanese to English: “What is a man? A miserable little pile of secrets,” 2Yes, I realize he’s quoting Malraux. It hardly matters. which is right up there with “You spoony bard!” in my book. Throughout this section, the player controls Richter Belmont, vampire hunter and warrior supreme. But Richter goes missing during the opening credits, and for the rest of the game (as far as I’ve seen, anyway), you get a long-haired bishounen who looks like CLAMP drew him. Perhaps the success of this game is what inspired Hideo Kojima to attempt the same thing a few years later in Metal Gear Solid 2? Well, maybe, maybe not. Regardless, it’s similar enough to make me wonder why the introduction of Raiden provoked so much fan outrage and the introduction of Alucard, Dracula’s half-vampire son, did not. It probably has something to do with the setting: Metal Gear ‘s military theming is a lot more macho than Castlevania‘s gothic, with its suggestion that immortality and super-powers are associated with aristocracy and poetic souls. But also, Alucard wastes no time in earning his badass cred. Where Raiden is presented at first as a newbie fresh out of the academy (his backstory later turns out to be a lie, but only after you’ve already formed a first impression of him) and spends his first few encounters hiding from guards, Alucard is out there taking out huge monsters with single blows of his terrible swift sword. Which, after a few rooms, is taken away from him, along with the rest of his stuff. But he still keeps his comet-trail of ghostly afterimages! Anyway, I’m finding this game pretty compelling, and can see why people still like it despite the dated VGA-looking graphics and terrible, terrible dialogue. I’ll probably post again tomorrow. 2. ↑ Yes, I realize he’s quoting Malraux. It hardly matters. The third ending I got was the Revenge ending, which is better than the Bad ending and requires no advance preparation, but which does require that the player manipulate certain environmental objects the right way. There’s a bit of a problem with that throughout the game: while some things can be clicked to perform discrete context-appropriate actions, like picking them up or reading them or lighting them with a tinderbox 1An unlockable video of an “early alpha” version shows tinderboxes being applied as inventory items, which you need to open the inventory menu to access, rather than as single-click actions. Changing this was a good decision, as was the elimination of “sanity potions”. , a lot of things need to be dragged through the 3D environment in specific ways. Doors open either inward or outward, levers pulled or pushed. Circular valve handles — which are far denser in this game than in my ordinary life — need to be rotated, which I always find tricky. Anyway, there are items in the Inner Sanctum such that it’s not at all clear how you’re supposed to manipulate them, and on my first attempt, I spent so much time trying to click them, apply inventory items to them, and even just throw rocks at them (an occasionally useful approach, but rendered moot here by the lack of loose rocks in the vicinity) that I wound up getting the Bad ending. I did figure it out on my third try, though, and I have to say that I think I prefer the Revenge to the Good one, because it feels a great deal more triumphant. The Good ending involves putting your fate (and that of your enemy) in someone else’s hands, and it’s kind of ambiguous about the result, beyond an assertion that it’s going to be okay. Am I alive? Am I still on Earth? It’s not clear. Whereas in the Revenge ending, you know exactly what’s going on: Daniel foils his antagonist’s plans and strolls stoically back to the entrance chamber, not really caring what happens to him next. It still leaves it open to question whether he actually makes it out of the castle, though. More significantly, all the endings leave it open to question whether Daniel deserves to escape. The dark descent referred to in the title isn’t just a physical movement downward, or a descent into madness, it’s also the lowering of Daniel’s moral standing in his backstory, as his desperation to save his own life led him to atrocity. This is one of the few games with zombies or zombie-like monsters that actually have specific reasons to hate the player character in particular. Yes, he was fooled into doing what he did, but only because he was selfish enough to allow himself to be fooled. There’s a diary entry or two you can find in which you can really see the cognitive dissonance in action: Daniel wants to see himself as the good guy, and thus leaps to accept his host’s questionable assertion that all the prisoners in the castle are unreformable criminals who deserve everything that’s done to them, and that their steadfast protestations of innocence just prove that they’re additionally liars. (Not for nothing is his name an anagram of “denial”, I suppose.) But towards the end, Daniel’s culpability is his greatest weakness, the one thing that can cripple him into temporary inaction and unresponsiveness to player control. In the final confrontation, the enemy tries to use it against him, and the only reason it doesn’t work is that, as Daniel’s mentor in monstrousness, he bears at least as much blame himself. Still, the ending confrontation leaves me a bit unsatisfied, probably because there’s so little to do: each of the non-Bad endings requires only one action, and they’re pretty much the only actions available. I suppose this is another part of why I prefer the Revenge ending: it makes you perform that action three times, which provides a little bit more opportunity to feel like you’re interacting with the world, rather than just answering a riddle. 1. ↑ An unlockable video of an “early alpha” version shows tinderboxes being applied as inventory items, which you need to open the inventory menu to access, rather than as single-click actions. Changing this was a good decision, as was the elimination of “sanity potions”. “More soon”, I said. I’m nearly a week late with this post. Of all the strictures of the Oath, the one about posting within 24 hours of a session is the one most frequently violated, but in this particular case, I’ve been procrastinating to a degree usually reserved for work. I think it has to do with the immense formal similarity between Amnesia and its predecessor, Penumbra: I’m having difficulty coming up with things to say about the former that I haven’t already said about the latter. So let’s focus on the differences here. The most obvious thing is the premise and setting. Penumbra is set in modern times, in a secret installation under the frozen wastes of Greenland — an approach that’s reminiscent of some of Lovecraft’s stories of primordial horrors lying dormant in places remote and inaccessible until an ill-advised expedition goes poking at them. Amnesia takes a more classical horror route, putting the action in a moldering German castle in the 19th century, where the protagonist went in hope of help escaping a curse destined to kill him. Note that Penumbra‘s premise is automatically one of exploration and discovery, while Amnesia‘s is not. To make it into one, the authors added the amnesia gimmick. Conveniently, this allows for an absolute minimum of exposition at the beginning (especially in contrast to Penumbra, which had an intro cutscene that dragged on a bit). Amnesia is a cliché in adventure games, but that’s because it’s so convenient. Penumbra was mainly structured as a series of hub areas, each with a number of puzzle-rooms on its periphery. Solving these rooms provided the means to proceed to the next hub area, after which point the passage back collapsed. Amnesia has some similar bits, but they’re not quite the same. In Penumbra, the hubs were where the monsters stalked you. That way, they didn’t have to interfere in your adventure-gaming in the peripheral rooms, where you could catch a breather from constantly running away, but still dread the moment when you’d have to come out and face them again. Amnesia inverts this: the hubs are the peaceful places, the peripheral areas are where the monsters can come crashing out of a side-chamber at any moment. This makes it all the more harrowing when you return to the hub after completing all the puzzles, and find that the walls have started growing fleshy pustules, a sign that the curse is catching up and it’s time to move on. It’s open to some question just how real such changes to the environment are. As in the second and third chapters of Penumbra, the player character is definitely hallucinating at least some of the time. In Penumbra, it was plot-linked: at specific points in the story, you’d hit a hallucination sequence. It’s more sophisticated in Amnesia: hallucination is conditional on your level of sanity. In addition to the obvious effects that can be applied anywhere — the screen warps queasily and the camera swerves out of your control, you hear voices, at one point I even had imaginary bugs crawling around — there are less obvious things: in one room I noticed a portrait that can appear as either a normal person or a mutated monstrosity, depending on how sane you are when you enter. This makes me wonder what other places I’ve passed through have similar variations, which in turn makes me wonder how wise a technique this kind of variability is. Players will only appreciate it when they know it’s happening. I suppose the sanity mechanic invites comparison to Eternal Darkness. I haven’t played it, but judging by various Youtube clips, the insanity effects there are in the nature of pranks: something weird happens, like the player character’s head falling off, and after a moment everything goes back to normal. Insanity effects in Amnesia, by contrast, are continuous: once the screen starts breathing, the only way it stops is if you regain some sanity, and the only way that happens is if you make progress in the game. Since the insanity effects are unpleasant to look at, this helps to drive the player forward — my impulse, on seeing my character freaking out, is to find a safe place and sit there until he calms down, but that just doesn’t work. This is more like the sanity mechanic in the pencil-and-paper RPG Call of Cthulhu, where the chief way to regain sanity is to complete an adventure. CoC also has an interesting notion about an inverse relationship between sanity and knowledge: as your Cthulhu Mythos knowledge goes up, your maximum sanity rating goes down. While Amnesia doesn’t seem to have quite the same thing going on, it does seem like the voices and hallucinations you get from madness function, to some extent, as hints about what’s really going on. We learn early on that the protagonist, Daniel, deliberately induced his amnesia for his own protection. Thus, sanity goes hand-in-hand with suppression of knowledge, and a lowering of your mind’s defenses may be the path to regaining lost memories. But it’s still something that you really don’t want to do. Which brings us to the problem of darkness. Both Penumbra and Amnesia give you limited light sources, but running out of lamp oil in Amnesia is a more serious matter than running out of flashlight batteries in Penumbra, partly because in Penumbra you could always revert to your infinite glowstick (which, I’ve argued, was a better light source anyway), partly because wandering around in the darkness in Amnesia eats at your sanity (sometimes with audible crunching). You can save on lamp oil by lighting stationary candles and lamps, using up your limited supply of tinderboxes instead. This can be worthwhile if you think you’re going to be spending some time searching a place, or revisiting it later — an element of planning that was absent from Penumbra‘s more diverse but shallower array of lights. Now, both games have monsters that you need to hide from, and which have a harder time finding you in the dark. Escaping such a creature is a simple matter of turning off your light, crouching behind something, and waiting for the background music to indicate that it has gone away. But in Penumbra, that’s all there was to it, whereas Amnesia has the complication of sanity loss. Ideally, you want to flee into a room with a nice opaque door and a candle you can light. Such rooms are not always available. In fact, if you’ve been overdoing it with the tinderboxes, there might not even be a dark corner to crouch in. And ultimately, you’re going to wind up wasting a lot of oil and/or tinder by blundering around the same areas trying to find what you’ve missed. Penumbra helpfully posted maps on the walls of its hub areas, helping the player explore thoroughly and plan routes to avoid the monsters. The thing is, by allowing you to feel like you know what you’re doing, aids of this sort work against the sense of nervousness. Areas in Amnesia have simpler layouts than in Penumbra, but you have to figure them out on your own, wasting valuable resources as you do so. You inevitably feel like you’ve wasted more than you should have — the game’s opening screens explicitly discourage save-scumming, so even if you reload and optimize, you’re going to feel like you’re doing it wrong. Well, there’s a close connection between fear and guilt, and some of the most effective horror games play on that. I’m thinking in particular of Silent Hill 2, but also Penumbra to some extent, particularly after Red’s death. Amnesia is beginning to look like it’s venturing into that territory as well. OK, time for more recent indie goodness. Amnesia: The Dark Descent, by the same team as Penumbra, is one of the games from the past year that garnered the most praise from people whose opinions I respect. Like the Penumbra games, it’s a first-person horror game. True to its title, and also like Penumbra, it seems to involve going downward a lot. There’s a Call of Cthulhu-style Sanity stat, which diminishes not just from witnessing horrors and being attacked by abominations, but also just from being in the dark. Of course, progressing to deeper underground chambers has the natural result of less natural light. There are lamps and candles located in stationary holders, and a lantern you can carry with you, but these are both based on limited resources that you have to find by exploring: tinderboxes to light the fixtures, oil to keep the lamp going. It seems like the game is inevitably going to make me run out of these things at some point, because that’s how horror in games works. I have to say that the horror stuff is a bit more on-the-nose than I was expecting from other people’s comments. When you think you’re alone and you suddenly see a humanoid form dodging around a corner ahead of you, there’s good opportunity to make the player nervous: let us catch only a glimpse, and not know what it was that we saw, and our imaginations will run wild. But no, the figure stands there for a moment, and walks around that corner fairly slowly, to make sure that the player gets a good look at it. Having the same figure suddenly turn out to be right next to you when you rotate your view is effective, but only as a cheap jump-scare. But I’m still in the early stages yet; maybe I’m not yet up to the stuff people raved about. The better, scarier stuff I’ve seen so far is the stuff that’s hard to interpret. Sometimes, for example, the screen just warps as if breathing. Is this a sign that I’m losing Sanity? I don’t know, and because I don’t know, I have to fear that it is. The rules in Penumbra were relatively cut-and-dried: your character had several discrete and easily-identifiable states, and it was always clear what triggered a state transition. Or maybe that’s just how I remember it, and the rules were no more obvious from the beginning there as here. 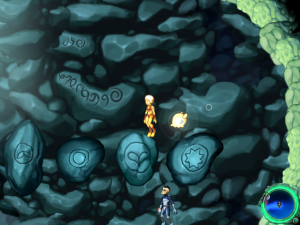 The nature of Aquaria‘s end boss is hinted at early on, in the cave where you learn your first song. There, you can find an evil-looking statue of a distorted face, with some kind of horns or tentacles attached. As you approach it, you hear a chuckle from a malevolent disembodied basso with good reverb, a bit like the voice of the Guardian in Ultima VII. On the wall, a word in Aquarian script identifies this being. That word: “Creator”. You’ve been fighting mad gods throughout the game, but this one is the original, the mad god to end all mad gods — or rather, to start them. It seems that all the dead races referenced in the game are his creations, experiments that ran their course and were discarded, leaving nothing but forsaken monsters. Even in your final battle with him, his signature attack consists of spawning new creations for you to fight, including shadowy versions of Naija herself. Like any self-respecting god, what Creator really wants is worship. But in asking for it, he comes off as a creepy stalker: “You will love me forever”, etc., with a strong undertone of “I want you to give up all hope of ever being anything other than my abject, dehumanized plaything, and if you don’t, you are my enemy and will be destroyed, just like so many others before you”. In other words, it’s the whole “God as Abuser” concept stripped bare. But in the end, after you defeat his final form, he turns out to be no Gnostic demiurge: creator of civilizations though he may be, he’s not the creator of the world. He’s just a traumatized child given way too much power. As the last of his own people, his sincere motivation for everything he’s done is simple loneliness — which is very explicitly Naija’s motivation as well. Is she less of a monster than him? She’s more sympathetic at the moment, but if the root cause of his evil is that he’s too powerful, what are we to say about someone who goes around killing gods? The approach to the end involves a fair amount of adventure-game-like puzzle-solving, where you’re thrown into unique situations and have to apply the correct song to make progress. The final boss fight itself continues this. It’s a multi-stage affair, going through four distinct phases, some with multiple sub-phases. The most affecting part, I felt, was the bit where Creator morphs into a one-eyed insect-like thing that scuttles off into the darkness, then repeatedly flees from your light like a cockroach. If there’s one thing scarier than a monstrosity, it’s a half-glimpsed monstrosity that doesn’t want you to see it. I’ll probably have more to say about that when I post about the next game. I’m generally pretty loose with spoilers on this blog. My goal in writing is to examine games in depth and detail, and tiptoeing around the plot just gets in the way of that. And I generally trust my readers to understand that a post with the word “Aquaria” in its title will contain information about Aquaria, and leave it at that. But today, I’m going to strongly recommend that anyone who’s playing Aquaria, or who thinks they might play Aquaria in the future, stop reading now, if you derive any satisfaction from solving puzzles on your own. I said before that the one way that Aquaria fails to fit the Metroidvania model is that it isn’t a platformer: instead of jumping on platforms, you swim freely in a water-filled vertical 2D space. This isn’t quite true. There are places where you can breach the surface, jump high into the air like a playful porpoise, and come kersplashing down again. And, this being the sort of game it is, there are places you can’t reach any other way — the simplest being sections of water that are cut off from the mainstream by a chunk of island that you can vault over. But there are also things far less accessible than that, such as completely dry vertical shafts. The in-game map shows you the entire shape of each zone you visit, including the shape of the bits you haven’t visited yet, so it’s clear that there’s stuff to be found up above, but getting there is a problem. Naija can survive on dry land, but, despite being humanoid, cannot walk on it. She’s accustomed to letting the water support her. Without it, she can only manage crouching and salmon-leaps. And there are places where this is sufficient to navigate the land, where the ascent is either gentle enough or irregular enough to leap up in steps. It’s tricky, though, because, just as underwater, you don’t have precise control over where you’ll wind up — the direction you jump in is affected by the angle of the surface you’re clinging to. I spent a considerable amount of time today repeatedly trying to get a sequence of jumps just right. Here, the game takes on all the frustrations of a conventional platformer, such as falling all the way to the bottom and having to start over. It’s sort of an inversion of the usual platformer, where the possibility of drowning means that the underwater sections are the annoying part. But even that doesn’t really apply to those sheer vertical shafts. It seemed like the only way to ascend those was to take them in a single superhuman leap. There are ways to extend one’s initial jump out of the water: using the Beast form (the only song-form capable of swimming against a strong current), eating soup for a temporary speed boost. But such techniques only take one so far. And so I was left with a puzzle. And it’s a pretty good puzzle, it turns out. The solution involves a bit of lateral thinking, in that it applies old tools in new ways. I mentioned before the Nature form, the fantasy-druid version of Naija with the power to make phallic-looking thorny plants burst out of the walls, damaging any enemies too slow or stupid to dodge a plant. The Nature form isn’t a very useful one generally, but it does have a few virtues, such as immunity to damage from sea anemones and spiky things — including those thorn plants I just mentioned. And again, this isn’t usually a very useful skill. Why would you want to create a dangerous plant and then touch it? Because you don’t want to just touch it. You want to land on it. You want to use a series of thorn plants as platforms to let you climb up the shaft. I had been focusing on the problem of how to extend the height of my leap, but what I really needed to do was divide the distance up so that I didn’t need to clear it in a single bound after all. It’s still tricky to do, and I did still sometimes wind up falling clear to the bottom and starting over, but at least it works. And once you have the insight of using thorn plants on dry land, there are other things you can do with them. Create one right under you, and the force of it springing out of the ground will propel you upward like a rocket. So, in the end, I did discover a new way to jump higher after all, but it’s a way that isn’t much use for ascending those vertical shafts. If there’s one thing the metroidvania format does well, it’s provoking a sense of place. You gain familiarity with the total layout of the gameworld because you spend a significant amount of time visiting the same places repeatedly — and not because the game forces you to, but voluntarily, because you want all the goodies that you couldn’t get at the first time around. It’s not like grinding in an RPG, because it isn’t about wandering the same stretch of ground waiting for random events. Your actions on revisiting are purposeful, or at least exploratory, and a monster you’ve met before is just something to be got past as efficiently as possible. Thus, revisiting places engenders mastery of technique. Aquaria‘s cooking system adds an additional motivation for revisiting places: collecting ingredients for cooking. Specific items are dropped by specific creatures which can be found in specific areas, so when you discover a new use for an ingredient, you have a new reason to go back to where it’s plentiful. And if you do, you do in fact wind up essentially grinding, despite what I said above. This is something best pursued in combination with other goals, other reasons for backtracking. Lately I’ve been going back for a purpose that yields no direct benefit: I’ve been deciphering the runes. There are things written on walls throughout the game in an invented script. It turns out it’s just an alternate alphabet, and that the messages are in English. The first hint of this is actually in the opening menu, which starts off showing all its text in the Aquarian alphabet, then fades to Roman. This can be used as a kind of Rosetta stone for deciphering the rest, but it’s not really necessary — the game provides enough samples of the script to make an easy cryptogram. I’ve managed to decipher 22 letters so far — the only ones missing from my mapping are J, K, Q, and Z, which simply haven’t appeared in any of the messages I’ve seen. The messages are mostly fairly predictable: the name of a city on a sign at its entrance, the word “Beware” just before a dangerous area, etc. But there are a few that are more interesting. One of the bosses has a lengthy message that I can only make out part of, because it’s partly blocked by the boss’s body, but it says something about someone devouring their own children — which, come to think of it, is a hint for the trick to defeating that boss. Elsewhere, in the place where I learned my first new song, “The light will guide her”. Another hint? At this point, I do have the power to create light, and I played with it a bit in that area to see if it opened up a hidden passage or something. But no, I think it’s just being metaphorical. The messages may be mostly banal, but simply by putting them in a kind of code, the game invests them with significance. When I passed them by the first time, they were mysteries, and gave a sense of the mysterious to the surroundings. Now that I’ve broken the code, they’re little bonuses, to be eagerly attacked just in case they have something important to say. One thing I keep forgetting about the plot-crucial bosses in this game is that they’re all gods. It’s an easy thing to forget because not all of the bosses are plot-crucial. There’s a fair number of optional ones, guarding optional but useful permanent enhancements of various sorts: some outfits with special properties; a song or two that you could get by without; in one case, the ability to cook three ingredients at a time without a kitchen (not a very useful skill so far, but I’ve got it anyway — it’s not like you know what you’re going to get before you’ve won the fight). There are four optional bosses (including the very first one you can access) that turn out to be protecting an egg bearing a smaller creature of the same species, which then becomes your pet and defends you. That’s right, it develops an attachment to its parent’s murderer, and will even help you to murder other parents so you can steal a better child to replace it with. The important bosses, though, have backstories that you learn from an expository cutscene on defeating them. And the backstories are all more or less the same: there was an ancient race with its own special god, but something went wrong, leaving the race extinct and the god twisted into a savage, insane monstrosity. Because you only learn this after you’ve defeated it, your first impression of these beings is always their degraded form. Only after you’ve destroyed them do you get glimpses of what they used to be, provoking a reevaluation of what it meant to fight and kill them. And then, in most cases, having destroyed them, you gain their powers. Each god-boss you kill teaches you a thematically-connected transformation song — not a direct transfer of the very attacks it used against you, as in Mega Man, but something vaguely related to what it’s supposed to be a god of. In essence, you’re slowly becoming a shapechanging (or at least outfit-changing) representative of all the dead races. There was a mention in one of the cutscenes about being destined to unite the various underwater tribes or something like that, and it looks like it means unite them in a single body. Which raises questions. There are at least two races of underwater-dwelling peoples that are still alive and thriving. Am I expected to somehow absorb them as well? Aquaria gives the player an inventory of cooking ingredients obtained by killing stuff and/or singing at plants. Collecting ingredients gives the player something to focus on after a fight, pursuing them downward as they plummet out of reach or sometimes following them laterally as they arc ballistically overhead. Different ingredients are plentiful in different areas — it’s easy to obtain crab meat in a cave full of crabs, for example — and there always seems to be some ingredient I’m short on, although which ingredient that is varies. All cooked foods are basically potions. They either heal you in some way (restoring hit points, curing the few status effects in the game), or they give you temporary bonuses, or both, depending on their ingredients. The most plentiful ingredients are meats and oils, and the most basic things you can prepare are Hot Soup (any oil plus any meat), Sea Cake (any oil plus any egg), Leaf Poultices (leaf plus leaf), and sushi Hand Rolls (leaf plus any meat). More exotic things like pierogies are also feasible, but those four forms are the things that seem to have the greatest number of variations, created by improving them with other items — a basic cake heals you a bit, but a cake plus a leaf yields a Veggie Cake that grants temporary regeneration. It’s notable that the order is significant here: (oil plus meat) plus leaf = Veggie Soup (regeneration), but oil plus (meat plus leaf) = Tasty Roll (healing x2). The game keeps track of what recipes you’ve discovered, and grants an Achievement for finding them all — something I’m still substantially short of. The nice part is that when you find an item in the wild, you instantly know its recipe. In fact, that’s the chief way that you learn the less intuitive combinations. Some of them are guessable, though, if you think like the game’s creators. Trying to put together an invalid combination yields Sea Loaf, a nigh-useless item that heals a tenth of a hit point. Nonetheless, if you’re going to do experiments, it’s important to max out on Sea Loaf. Your inventory can hold only up to eight of each item, and if you have that many of something, the game doesn’t let you make any more. So if you have eight Sea Loaves already, you can try throwing any random ingredients together, secure in the knowledge that the game won’t waste them on additional Sea Loaf. My own biggest kitchen triumph was intuiting that turtle soup was a possibility, on the sole basis that I had some turtle meat and no known use for it. I did eventually find the turtle soup recipe the other way, but only after I had used it in several boss fights: turtle soup grants the strongest defensive bonus of any food I’ve seen. Boss fights are pretty much the only place I ever use food. Occasionally I’ll admit to myself that I need to consume a healing item outside of the boss fights, but it always seems like a waste, given the number of other sources of healing in the game. But when facing a boss, I throw on as many buffs as I can, because I know from experience that it makes the difference between victory and defeat. The thing is, boss fights only happen occasionally, and I probably have enough food on hand already to last me through all the bosses that remain. But I’m still hoarding food, scavenging anything I’m short on, trying to get as close as I can to keeping eight of everything on hand all the time. Not because I need to, but just because it’s one of the activities that the game provides. If you ask me, the demo for Aquaria is misleading. This is because the demo is the beginning of the game, and the beginning of the game is the safe, comfortable area around Naija’s home. Brightly colored corals and anemones, shafts of sunlight streaming down, and if there are some dangerous fish about, there are also schools of harmless ones roaming about looking decorative. Towards the end of the demo, there’s a brief glimpse of things to come, in the form of an interactive vision granted by a figure in a black cloak who appears in front of you without explanation: suddenly you’re in the shooting-stuff form and surrounded by bullets. This is your first glimpse of that form — presumably it was inserted so that the demo/beginning wouldn’t be too entirely misleading. But even there, the context made it seem like this was some kind of “Dark Naija” thing that you’d be shifting into involuntarily as the story (and level design) demanded it, like in Prince of Persia: The Two Thrones. But no, switching into shooty mode is a voluntary act, and in fact I tend to stay in that form by default, because that’s usually the best for reacting to surprises. What I really wasn’t expecting from the intro, though, is that I’d be using that form to kill those harmless fish I mentioned so I could use their meat and oil as crafting ingredients. Which shows how much I had misunderstood Naija’s relationship to the things around her, and also how quickly my attitude changes when I’m running low on healing items. The thing that was really unexpected from the intro, though, was the descent into the Zerg Creep. There a certain lost city, probably once home to Naija’s ancestors, now home to aquatic ghouls. The walls sport what look like blood vessels in places, then turn into masses of exposed flesh, throbbing in places. There’s a skull-like door barred by what appear to be intestines. This is not the happy frolicking-in-the-sun-dappled-lagoon game I signed up for! I mean, I’m okay with it. But I haven’t even penetrated the deepest darkness yet; I expect there’s worse stuff to come. I recall being taken aback by the shift in Ecco the Dolphin as well, which starts off as a story about a dolphin, and then suddenly sends that dolphin into outer space to defeat an alien invasion. Perhaps there’s just something about the undersea setting that changes my expectations. There’s nothing unusual about going to outer space in a videogame, just as there’s nothing unusual about shifting into veins-and-viscera decor as you get closer to the end boss. When a game starts off in a pleasant pastoral setting, I don’t normally expect it to stay there. But somehow, when it’s a pleasant underwater setting instead, I kind of expect it to not stray too far.